Our exfoliating, moisturizing, skin-smoothing sea salt glow is a whole-body spa treatment in one simple step! 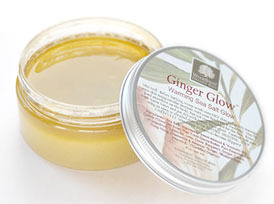 For a warming treat, use on dull, dry skin to reveal your own naturally healthy, vibrant, glowing complexion. How it Works: WoodSprite Sea Salt Glows are made with finer salts than most of our competitors. This results in gentler exfoliation and smoother skin. Salt Glows work by exfoliating dead skin cells, increasing blood flow and stimulating skin cell renewal, while deeply moisturizing skin with nourishing oils. Our combination of oils is unique; only the finest exotic nut and fruit oils are chosen for their rich vitamin content and quick absorption. Finally, pure essential oils uplift your spirits while toning and stimulating your satiny new skin! When to Use: Weekly, or before a hot date -- anytime you want your skin to feel smooth, silky and irresistably touchable! How to Use: Mix well. Before showering, scoop scrub onto DRY skin and gently massage in circular motions with your hands (as if washing). May be used anywhere on your body, but not recommended for the face. Rinse with warm water or shower as usual and pat dry with towel. No need for additional moisuturizers. Use weekly to maintain healthy, glowing skin. Ingredients: Sea Salt, *Organic Grapeseed Oil, *Organic Sweet Almond Oil, *Organic Avocado Oil, Organic Castile (*Organic Olive Oil) Soap, *Organic Fair Trade Cocoa Butter, *Organic Mustard Seed, *Organic Ginger Root, Natural Vitamin E & Pure Essential Oils of *Organic Lavender, Bergamot, Ginger Root, Clove Bud, Allspice, Lime, White Grapefruit, Roman Chamomile, Ylang Ylang & Cassia. (*Certified Organic) Best for dry skin.